The Weekend Gourmet: Wendy's Favorite Things for December...Featuring My Holiday Gift Guide for Foodies! Wendy's Favorite Things for December...Featuring My Holiday Gift Guide for Foodies! I don't know about you, but I'm finding it hard to believe that the holidays are infull swing and Christmas is less than 3 weeks away! 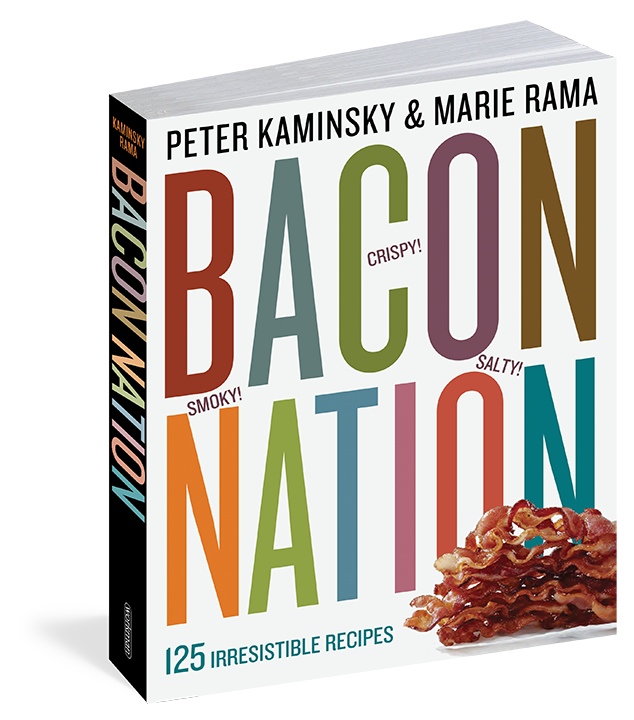 If you're making a list and wondering what to buy all the cooks and food lovers on your shopping list, I've got you covered. This month's Wendy's Favorite Things is featuring some of my very favorite ideas to please the pickiest of foodies. I've got something for everyone, no matter what your price range is. Come check it out! My pick for the perfect holiday present for fashionable foodies is the gorgeous aprons found online at Jesse Steele. They offer adorable aprons in a huge variety of styles and colors, so there's something to suit everyone. If you think aprons are just for grandmothers, think again! 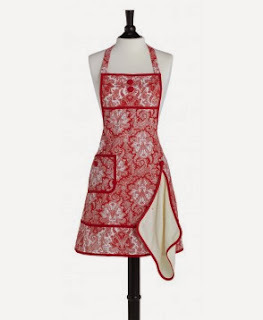 I have the red and cream apron pictured, and I absolutely love it. This particular style comes with a detachable matching hand towel that makes it really easy to wipe my hands while I'm cooking in the kitchen. It's also red -- my favorite color -- and the halter style is very flattering. If aprons aren't on your gift list this year, don't fret. Jessie Steele also offers cute two-piece pajamas and lots of fun accessories. Prices for most of their aprons range from $25 to $50. Go check out their online holiday catalog...and be sure to take advantage of their free shipping offer when you spend $75 via their website. Do you have anyone with a sweet tooth -- or two -- on your gift list? I've got three suggestions that I guarantee they will love. We discovered all three of these gourmet sweets during recent visits to New York, and all three offer handy online shopping and will ship across the country. If you're on the lookout for creative gourmet cookies, Ruby et Violette has just what you're looking for. Their creative cookies come in delicious flavors like Red Velvet and Champagne Strawberry. The Giverny Box box pictured below is my personal favorite. For $44.50, it contains a dozen cookies in six hand-picked flavors. They come packaged in gorgeous seasonal red packaging and are sealed in clearly labeled two-cookie packages to ensure maximum freshness. If cutting-edge sweets are more your thing, then Liddabit Sweets is right up your alley. They feature caramels, candy bars and other sweets in a variety of creative and adventurous flavors, including Beer & Pretzel Caramels and The Dorie. That's a candy bar that features a chocolate sable cookie, salted caramel ganache, sauteed dried apricots and a touch of black pepper. It's definitely not your average candy bar...but it's downright addictive! I also told you all about The Treat House recently...and I knew they had to be included in this gift guide as well. Their delicious handmade decorated marshmallow treats come in fun flavors like Chocolate Mint and Salted Caramel. I promise that kids of all ages will love these gourmet goodies! A dozen two-bite treats plus the colorful packaging pictured is only $29, and they ship within the US. 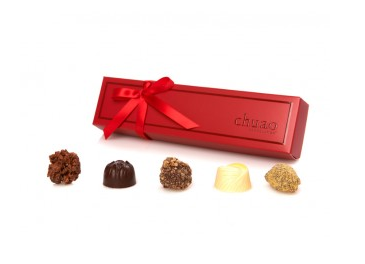 I recently discovered a fun line of artisan chocolates called Chuao Chocolatier. This California-based artisan chocolate shop is offering some of the most creative chocolate flavor combos that I've seen in some time. Not only that, the quality is superb! For the holidays, Chuao Chocolatier is offering an affordable 5-piece Holiday Bonbon collection for $12.95. It contains seasonal flavors like Peace Love & Peppermint. If chocolate bars are what you're looking for, Chuao's Salty Sweet Bar Set is really fun. This boxed set is $20 and contains four 2.8-ounce bars: Potato Chip (milk), Salted Chocolate Crunch (dark), Ravishing Rocky Road (milk) and Maple Bacon (milk). Keeping with the holiday theme, all of Chuao's gift sets are packed in festive red boxes. If you're shopping for someone who loves to bake, I've got a couple of great holiday gift ideas for you. My first suggestion is an essentialtool that I believe every kitchen should have: a Silpat non-stick silicone cooking mat. 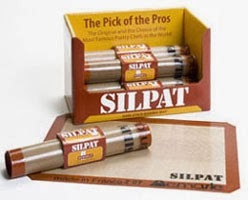 Silpat comes in a wide range of sizes to fit any size pan. I use my Silpat all the time, and nothing ever sticks to it -- even sticky puff pastry turnovers! They're durable and dependable too. They can be found a major US retailers, including Bed Bath & Beyond. Pair it with a matching-sized baking sheet and add a few of your favorite recipes, and it's the perfect present for anyone who bakes. 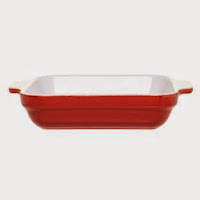 My other baking suggestion is Emile Henry bakeware. This glazed ceramic bakeware is made in France, and its highly regarded for even baking. I have several of their pieces and have gifted them to family members, who also rave about how much they love them too! I recently added a square baker to my collection. It's perfect for making small coffee cakes and casseroles. Because it's so pretty, you can serve directly from the pan. This 9x9 baker retails for approximately $40. For socially conscious foodies, you can give a gift and help change a life via World Vision. For as little as $25, you can purchase two chickens in your recipient's name to feed a child who lives in poverty around the world. These chickens will provide the child and his or her family with a steady supply of protein via fresh eggs. Additionally, extra eggs can be sold to provide extra income to the child's family. You can also purchase a $25 donation toward a Clean Water Fun to provide clean sustainable drinking water in countries like Niger. If you prefer, you can donate $85 for World Vision to use wherever need is greatest. In return, you'll receive a gift of Prosperity Cinnamon to give your recipient. 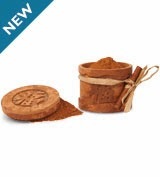 The box is cassia wood carved with an Asian symbol for prosperity, and it contains 3 ounces of flavorful Vietnamese cinnamon. It makes a very nice memento of your donation on behalf of a family member of friend. 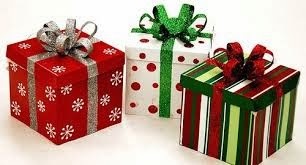 Each gift purchased via this program includes a card to give your recipient telling them about the gift purchased in their name, as well as the lasting impact that it will have on a child living in poverty. If you're shopping for a discriminating gourmet food lover this season, I've got a trio of fantastic ideas to share. 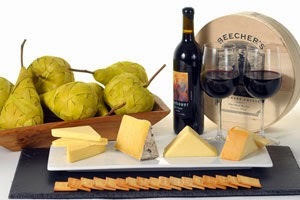 If you have a cheese lover to buy for, look no further than Beecher's Cheese. This Seattle-based cheese shop has some of the best cheddar I've ever tasted. We discovered their award-winning Flagship Reserve Cheddar on a trip to San Francisco a few years ago, and it's our favorite cheddar. Beecher's offers a wonderful Flight of Flagship gift set that contains Flagship, Flagship Reserve, Raw Milk Flagship and Smoked Flagship. The set is $59 and comes packaged with artisan crackers in a round wooden box. All your lucky recipient has to do is add wine and fruit for a fantastic snack! My second gourmet recommendation are the fabulous New England specialties from Hancock Gourmet Lobster Co. If a ticket to Maine isn't in the budget, send some of Hancock's deliciuos mail order lobster rolls, clam chowder or whoopie pies! Everything you need for a New England-style feast comes expertly packed. All you have to do is assemble or heat...and get ready for a fabulous meal. For $99.95, you can send the Lobster Rolls & Whoopie Pies set. It will feed six hungry and grateful people. If you're looking for something in a lower price range, then the clam chowder is a great choice. For $24.95, you'll receive 32 ounces of chowder that's chock full of clams and potatoes. Simply reheat and enjoy...it's creamy and rich. I've tried all of these items personally and can vouch that the quality and flavor are outstanding. Last, but not least, is a suggestion for cooks who love to use artisan condiments: olive oil and vinegars from California-based O Olive Oil. Their products taste great and come in a wide range of gourmet flavors. My favorite flavors are the blood orange olive oil and the pomegranate champagne vinegar...it's a taste of Summer in the middle of a cold snap! 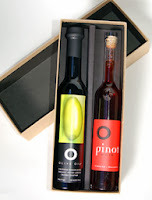 I personally love their Natural Box Duos, which contain a bottle of olive oil and a bottle of vinegar or a duo of flavored olive oils. Duos include Clementine Olive Oil & Champagne Vinegar and a Meyer Lemon & Blood Orange Olive Oil set. Prices for the two-bottle sets range from $28 to $36, depending on which duo you select. As a bonus, they're offering free shipping for $60 worth of items sent to one address! If you have a cookbook collector to shop for, it can be confusing to figure out which one to choose. There are so many options available that it gets frustrating. I have two suggestions to share from the cookbooks I've received and reviewed this year. 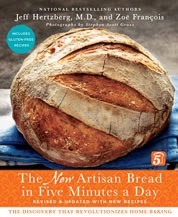 First up is The New Artisan Bread in Five Minutes a Day. Authors Zoe Francois and Jeff Hertzberg's book can teach anyone how to make gorgeous artisan bread using their simple techniques. It allows even a reluctant baker like me to get fantastic results with minimal effort. This is a cookbook that everyone from beginner to expert bakers can learn from. 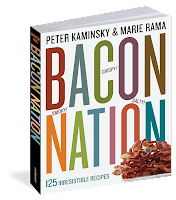 If you have a bacon lover on your list, Bacon Nation is a must-have cookbook.This cookbook features smoky-salty bacon in 125 different recipes. It features everything from appetizers to desserts. The photographs are gorgeous, and the recipes are mouthwatering. So far, I've tried the simply sublime Pasta Alla Gricia and the Bacon-Wrapped Shrimp with Scallions & Ginger. Both were fabulous. I can't wait to dive into this cookbook more for upcoming holiday parties. These cookbooks can both be purchased at major book retailers in the US, as well as online via Amazon. One of the very best ways to celebrate the holidays is by lifting a glass and toasting to family, friendship...or even the New Year. One of my favorite holiday gifts to give is a bottle of bubbly or a some nice whiskey...depending on which my intended recipient prefers to imbibe with. My pick for bubbles this year is Mumm Napa's Brut Prestige. Since this wine is produced in California, it can't be called champagne...but this sparkling wine is a winner! It's full of bubbles and has a crisp light taste. The average retail price is $22 per bottle, making it an affordable indulgence. Include a pair of toasting flutes and a box of chocolates, and you have the perfect gift to give someone to ring in 2014. 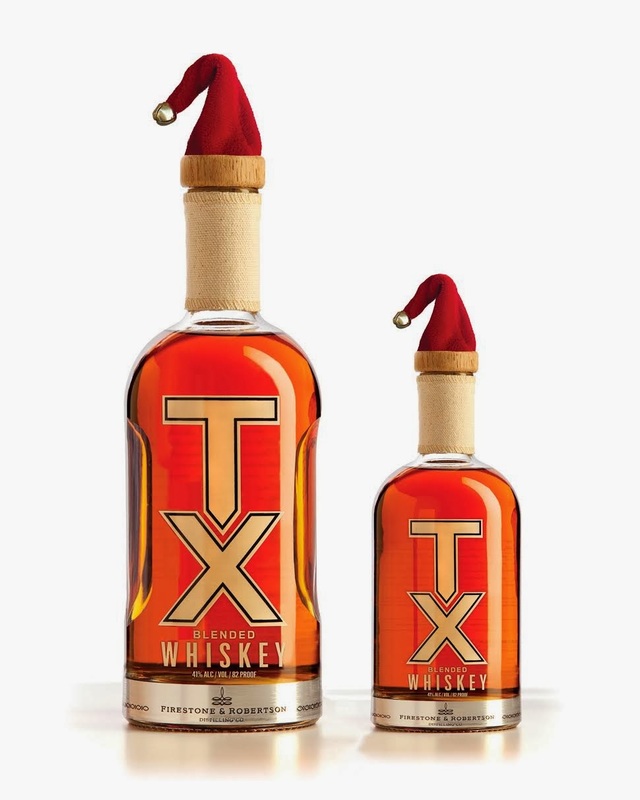 If you're gifting someone who prefers liquor to wine, I highly recommend award-winning T-X Blended Whiskey from Fort Worth-based Firestone & Robertson Distilling. This auburn-hued whiskey is 82 proof and features tasting notes of honey butter, banana, caramel and coffee. It's smooth and slightly sweet, making it ideal for sipping or for mixing in your favorite cocktails. 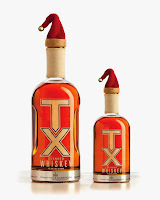 It can be purchased at liquor stores throughout Texas and retails for $35 for a 750 mL bottle. They're even offering seasonal packaging with a Santa bottle topper. 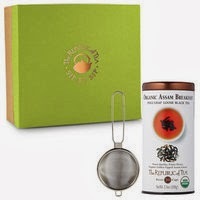 If you're shopping for a tea lover, you can't go wrong with Republic of Tea's Custom Tea & Infuser Gift. For approximately $25 (depending on which variety of loose tea you select), you'll receive a container of loose tea and a mesh dipper infuser. It comes packaged in a pretty green box, ready to put under the tree. Republic of Tea offers a wide variety of loose teas, so you're sure to find one that's perfect for anyone you're shopping for. I opted to try Jasmine Jazz Full-Leaf Green Tea. The infuser is simple to use, and the tea is fragrant and tasty. I like to lightly sweeten my tea, and I find it very relaxing to sip on a cool Texas night. You could also add a pretty tea or coffee cup to round out this package. One of my friends finds gorgeous vintage tea cup and saucer sets at garage sales and antique shops. That would work really nicely here as well. Disclosure: The companies and products featured in this roundup provided me with sample items of each product to facilitate inclusion. I received no further compensation, and all opinions expressed are based on my personal experience using the items.